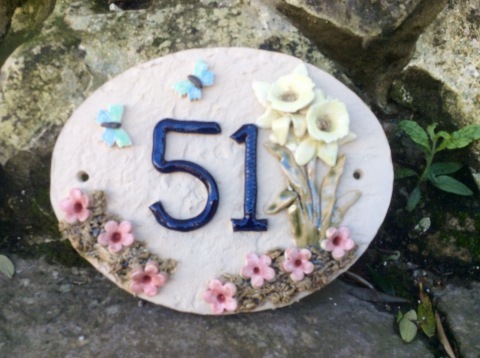 Ceramic Crafts | House Numbers | Oval - daffodil and butterfly design. House Numbers > Oval - daffodil and butterfly design. Oval - daffodil and butterfly design. MADE FROM STONEWARE CLAY. FROST PROOF AND WILL NOT FADE IN STRONG SUNLIGHT. Please let me know if you would prefer different colours.